It does not matter what type of party or event you are organising the Hog Roast Irvine team is here to help. Over the years, we have provided spectacular food for all kinds of people, and we look forward to doing the same for you. Our experienced team are passionate about what they do. They love cooking tasty dishes, using the best locally sourced ingredients. Ordering is really easy. All you need to do is to decide whether to serve a complete spitting pig or joints of roasted beef, ham or lamb, and let us know. We will then source the best meat from a local provider and cook it all to perfection in front of your guests. If you prefer, we can also spit roast whole turkeys or chickens. We also offer an extensive menu of vegetables, salads, stuffing, potatoes, canapés and desserts for you to choose from. All dietary needs and tastes are covered. This makes it easy for you to find the dishes you need to make sure that every guest goes home well fed, impressed and happy. You can choose to have the meat served simply in buns, alongside a buffet, or as part of a carvery. Whatever you choose we bring the necessary equipment and take care of serving the food. 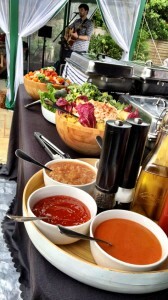 If you are holding a formal event and want your guests served at the table, we can provide that service too. The Hog Roast Irvine team also offers you the opportunity to do, some, or all of the cooking yourself. We hire out spit roasting machines and show you how to use them to cook the meat of your choice. To hire the Hog Roast Irvine team all you need to do is to ask for a quote. If you like the price, just confirm your order and let us take care of everything else.